DES PLAINES, Ill.—On every single day from January 1, 2016, through December 31, 2018, an average of 209 vehicles were stolen across the U.S. because drivers left their keys or fobs in their vehicles making them attractive targets for thieves. Today’s report from the National Insurance Crime Bureau (NICB) shows that during this three-year period, a total of 229,339 vehicles were stolen in this manner—a 56 percent increase since 2015. When including the numbers from 2013, that increase balloons to 88 percent. 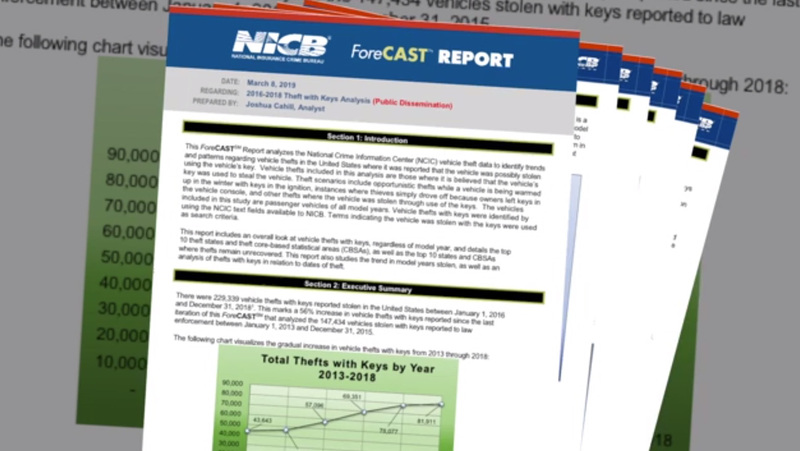 NICB analysts reviewed data contained in the National Crime Information Center’s stolen vehicle file to produce this report. 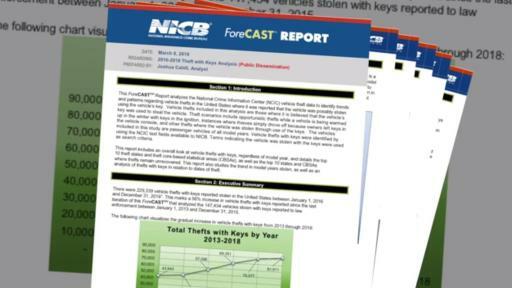 Records were queried using thefts with keys and similar variants as search criteria. The number of thefts with keys or fobs left inside may be substantially higher since many drivers don’t admit to making the mistake, and it’s not reported in the police report or insurance claim. 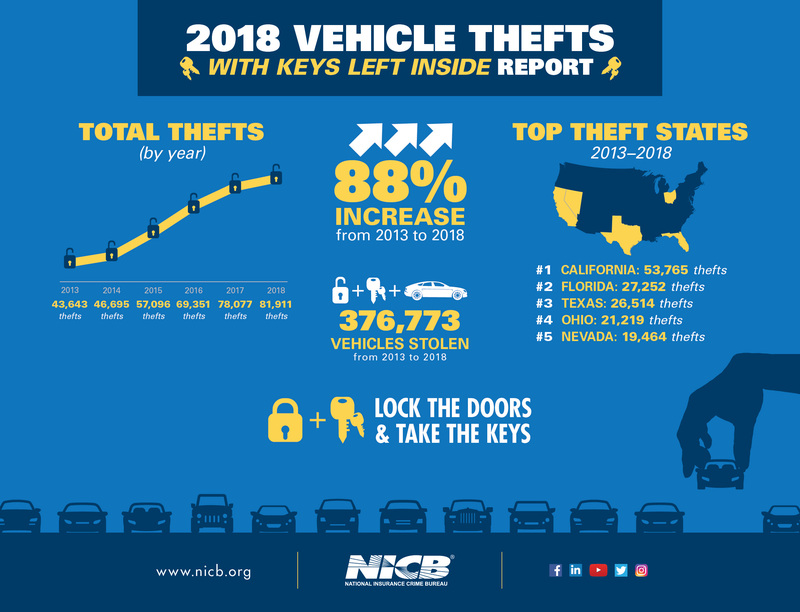 While national vehicle thefts have enjoyed a steep decline since 2003, in recent years, there have been some upticks in thefts; most notably in 2016 when 765,484 vehicles were reported stolen—an increase of 57,726 from 2015. According to today’s report, in that same year, 69,351 vehicles were stolen as a result of keys or fobs remaining in the vehicle. Had those complacency thefts not occurred, 2016 would have posted a decrease rather than an increase in annual vehicle thefts. 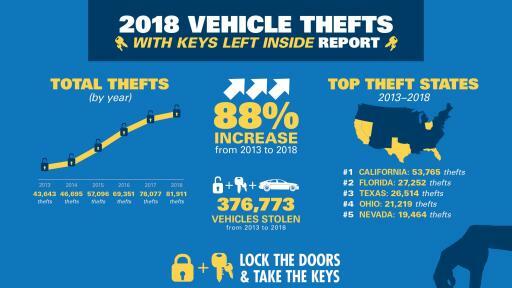 The top five states with the most thefts with keys during this period were: California (31,185), Florida (17,300), Texas (15,511), Ohio (12,596) and Nevada (11,391). The top five Core-Based Statistical Areas (CBSA) with the most thefts with keys were: Las Vegas-Henderson-Paradise, NV (11,073); Miami-Fort Lauderdale-West Palm Beach, FL (7,549); Atlanta-Sandy Springs-Roswell, GA (7,501); Chicago-Naperville-Elgin, IL (7,086); and Dallas-Fort Worth-Arlington, TX (6,603). Warming and cooling vehicles seems to have played a part in these thefts since the most occurred in winter and fall. December was first with 22,155. It was followed by January (21,384), November (20,080), October (19,918) and July (19,811). The top five specific dates with the most reported thefts were in January and December, with January having four of the five. January 1, 2018, was the top spot with 321 thefts. January 3, 2018, was next with 309 thefts, followed by January 5, 2018 (307), December 27, 2017 (299) and January 2, 2018 (296). Reviewing day-of-week theft occurrence data, Monday was the preferred theft day with 34,948 thefts. Friday was next with 33,582, followed by Saturday (33,214), Sunday (32,100) and Tuesday (32,085). Lock the vehicle, set the alarm and take all keys or FOBS. Do not leave the garage door opener in the vehicle. Take a picture of your registration on your cell phone and do not leave the registration or other papers with personal information in the vehicle. Never leave a car unlocked and running to warm it up or while stopping for a quick cup of coffee. It only takes a moment for the opportunistic thief to jump inside and drive off. The full report can be viewed and downloaded here. The full dataset is here. Download an infographic here and a video is available as well. About the National Insurance Crime Bureau:Headquartered in Des Plaines, Ill., the NICB is the nation's leading not-for-profit organization exclusively dedicated to preventing, detecting and defeating insurance fraud and vehicle theft through data analytics, investigations, learning and development, government affairs and public awareness. The NICB is supported by more than 1,100 property and casualty insurance companies and self-insured organizations. NICB member companies wrote over $461 billion in insurance premiums in 2017, or more than 81 percent of the nation's property/casualty insurance. That includes more than 95 percent ($218 billion) of the nation's personal auto insurance. To learn more visit www.nicb.org.